The humble request is to please pray for the dedicated followers of Srila Prabhupada, ISKCON and the Vedabase devotees. Please help these devotees as much as possible if it is not too much difficulty. Please note their contact information at the bottom of the pages with Vedabase online. I was told they need to completely re-create and update the Vedabase research software. Here is some contact information for your convenience. The following passages are found in the Maha Vedabase. My thought is to bring out the significance of the “Dream” anology often found in these Hare Krsna teachings. Our presence in the material existence is a complex multi-dimensional dream. The true reality is the spiritual world with God, Lord Sri Krsna and His eternal associates. The body of such a liberated yogi, along with the senses, is taken charge of by the Supreme Personality of Godhead, and it functions until its destined activities are finished. The liberated devotee, being awake to his constitutional position and thus situated in samadhi, the highest perfectional stage of yoga, does not accept the by-products of the material body as his own. Thus he considers his bodily activities to be like the activities of a body in a dream. Narada continued: O you who are free from all sinful activity! No one can counteract the effects of fruitive activity simply by manufacturing a different activity devoid of Krsna consciousness. All such activity is due to our ignorance. When we have a troublesome dream, we cannot relieve it with a troublesome hallucination. One can counteract a dream only by awaking. Similarly, our material existence is due to our ignorance and illusion. 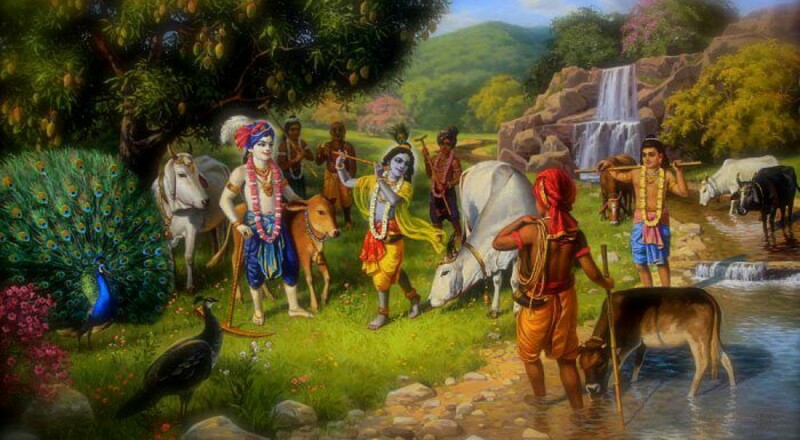 Unless we awaken to Krsna consciousness, we cannot be relieved of such dreams. For the ultimate solution to all problems, we must awaken to Krsna consciousness. Sometimes we suffer because we see a tiger in a dream or a snake in a vision, but actually there is neither a tiger nor a snake. Thus we create some situation in a subtle form and suffer the consequences. These sufferings cannot be mitigated unless we are awakened from our dream. Everything happening within time, which consists of past, present and future, is merely a dream. That is the secret understanding in all Vedic literature. The individual soul bereft of Krsna consciousness has many ideas and activities created in the mind by the external energy. They have been existing from time immemorial. Sometimes they are manifest in the wakening state and in the dream state, but during deep sleep [unconsciousness] or trance, they disappear. A person who is liberated in this life [jivan-mukta] can see all these things vividly. As one mistakenly considers a flower garland to be a snake or experiences happiness and distress in a dream, so, in the material world, by a lack of careful consideration, we differentiate between happiness and distress, considering one good and the other bad. Sukadeva Gosvami said: Maharaja Ambarisa, the most fortunate personality, achieved the rule of the entire world, consisting of seven islands, and achieved inexhaustible, unlimited opulence and prosperity on earth. Although such a position is rarely obtained, Maharaja Ambarisa did not care for it at all, for he knew very well that all such opulence is material. Like that which is imagined in a dream, such opulence will ultimately be destroyed. The King knew that any nondevotee who attains such opulence merges increasingly into material nature’s mode of darkness. A sleeping person imagines an alternative reality for himself and, seeing himself as having various names and forms, forgets his waking identity, which is distinct from the dream. Similarly, the senses of one whose consciousness is bewildered by illusion perceive only the names and forms of material objects. Thus such a person loses his memory and cannot know You. Just as a dream is merely a creation of one’s intelligence but has no actual substance, similarly, material lamentation, illusion, happiness, distress and the acceptance of the material body under the influence of maya are all creations of My illusory energy. In other words, material existence has no essential reality. One who is enlightened in self-realization, although living within the material body, sees himself as transcendental to the body, just as one who has arisen from a dream gives up identification with the dream body. A foolish person, however, although not identical with his material body but transcendental to it, thinks himself to be situated in the body, just as one who is dreaming sees himself as situated in an imaginary body. Although the sky, or space, is the resting place of everything, the sky does not mix with anything, nor is it entangled. Similarly, the sun is not at all attached to the water in which it is reflected within innumerable reservoirs, and the mighty wind blowing everywhere is not affected by the innumerable aromas and atmospheres through which it passes. In the same way, a self-realized soul is completely detached from the material body and the material world around it. He is like a person who has awakened and arisen from a dream. With expert vision sharpened by detachment, the self-realized soul cuts all doubts to pieces through knowledge of the self and completely withdraws his consciousness from the expansion of material variety. According to My instructions, one should fix the mind on Me alone. If, however, one continues to see many different values and goals in life rather than seeing everything within Me, then although apparently awake, one is actually dreaming due to incomplete knowledge, just as one may dream that one has wakened from a dream. Those states of existence that are conceived of as separate from the Supreme Personality of Godhead have no actual existence, although they create a sense of separation from the Absolute Truth. Just as the seer of a dream imagines many different activities and rewards, similarly, because of the sense of an existence separate from the Lord’s existence, the living entity falsely performs fruitive activities, thinking them to be the cause of future rewards and destinations. One should see that the material world is a distinct illusion appearing in the mind, because material objects have an extremely flickering existence and are here today and gone tomorrow. They can be compared to the streaking red line created by whirling a fiery stick. The spirit soul by nature exists in the single state of pure consciousness. However, in this world he appears in many different forms and stages of existence. The modes of nature divide the soul’s consciousness into normal wakefulness, dreaming and dreamless sleep. All such varieties of perception, however, are actually maya and exist only like a dream. The material body certainly moves under the control of supreme destiny and therefore must continue to live along with the senses and vital air as long as one’s karma is in effect. A self-realized soul, however, who is awakened to the absolute reality and who is thus highly situated in the perfect stage of yoga, will never again surrender to the material body and its manifold manifestations, knowing it to be just like a body visualized in a dream. O most charitable Uddhava, what is called birth is simply a person’s total identification with a new body. One accepts the new body just as one completely accepts the experience of a dream or a fantasy as reality. Just as a person experiencing a dream or daydream does not remember his previous dreams or daydreams, a person situated in his present body, although having existed prior to it, thinks that he has only recently come into being. The soul’s material life, his experience of sense gratification, is actually false, O descendant of Dasarha, just like trees’ appearance of quivering when the trees are reflected in agitated water, or like the earth’s appearance of spinning due to one’s spinning his eyes around, or like the world of a fantasy or dream. For one who is meditating on sense gratification, material life, although lacking factual existence, does not go away, just as the unpleasant experiences of a dream do not. In a dream one can see his own head being cut off and thus understand that his actual self is standing apart from the dream experience. Similarly, while awake one can see that his body is a product of the five material elements. Therefore it is to be understood that the actual self, the soul, is distinct from the body it observes and is unborn and immortal.